Future has a robust curriculum that closely aligns with CCR Standards. Future helps students acquire essential language and 21st-century employability skills, and equips them with core competencies to read, write, and speak in English, to think critically, and to solve problems. Future has now been enhanced with additional lessons that develop students’ essential reading and writing skills in line with the CCR Standards, preparing students to transition into further education and career training. There is a new CCRS Reading & Writing Lesson for every unit in the core text (Levels 1-5). Content is related to the core unit theme and can be used alongside the core text. The reading and writing activities complement and supplement both the content and skills taught in units of the text. The new Reading Lessons in Future reflect the shifts in reading instruction as introduced by the CCR Standards. They include level-appropriate informational and complex texts, as well as academic vocabulary, graphs, charts, tables and infographics. They require learners to read complex texts, cite evidence, and build knowledge in order to develop essential skills necessary for academic and career readiness. The aim of Future’s new Writing Lessons is to develop and enhance students’ essential writing skills. As students move up through the levels of Future, they learn to write to inform, explain, and make substantive arguments. They complete level-appropriate writing tasks. 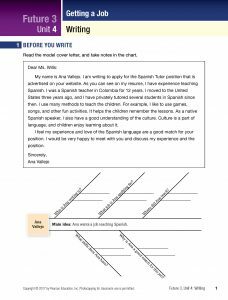 The Writing Lessons focus on analyzing sources, gathering evidence, and conducting research and lead learners to write well-organized paragraphs, essays, and narratives. The Writing Lessons are available in printable format on MyEnglishLab and the Essential Online Resources.